27-Jun-2009 -- 27-Jun-2009 -- It was a beautiful, sunny Saturday afternoon, ten years to the day after the previous confluence visit, where at the intersection of Routes 53 and 144 in the village of Moshannon PA, I turned down Gorton Road, which leads to the area of the confluence. The road became dirt and gravel after passing a few houses along the road. I reached a one lane bridge over the Black Moshannon creek and continued along as the creek skirted the road again before dead ended near Interstate 80. My plan was to walk along the deer fence near the highway, mentioned in the previous visit and then head straight downhill when I hit 78.00.000 on the GPS. I got off to a good start, but then the heavy brush and vines and briars make progress very slow. After about 20 minutes of very little progress, with cuts and scratches on my arms and legs, I gave up and headed back to my car. I was thinking there had to be a better way to reach the confluence, other than the previous route reached from the shoulder of I-80. After reading about the previous visit, and looking at my maps, I knew the spot was very close to the Black Moshannon Creek (“Crick” in Pennsylvania dialect) and I decided to go back to where the water was near the road and follow it until I reached my objective. I parked and followed a woods path along the creek until it crossed a narrow dirt road that turned out to be a driveway. Eventually I came to an old hunting camp along the creek. I believe this is the “Appalachian-Looking Farm” mentioned from the unsuccessful visit of 1997. It is a beautiful isolated camp EXCEPT for the roar of Interstate 80 on the other side of the water. The driveway ended and became a path that continued along the creek, before becoming a narrow ATV trail. I followed this for about a quarter mile, until it left the waters edge and headed deeper into the woods. I was a little confused, but continued to follow the muddy, rutted ATV path until it went sharply uphill and met the abandoned railroad right of way. The right of way is now the Snow Shoe Rails to Trails path and it provided a nice smooth place for walking. I hiked down the grade, and was passed by the occasional ATV rider. The right of way then crossed the Black Moshannon Creek on an old railroad trestle, before passing a huge elaborate vacation house directly on the creek. I then came to the second railroad trestle called the Rock Run Bridge. From my map, Rock Run flows directly to the confluence area where it meets the Black Moshannon Creek. I finally got the reading of 78.00.000 and left the right of way and headed downhill to the confluence. I reached the creek and the confluence seemed to be right in the middle of the water on a small island. I removed my hiking boots and socks and walked across the cool water to the island. Putting my boots back on, I went back and forth and decided the spot must be on the north bank where No Trespassing signs were tacked on to many trees. I was about to take my boots off again for another crossing, but said the heck with it and waded right into the nice refreshing waters of the creek. I reached the other side and hit 41.000.00, and turned and went right along the north bank and then back into the water until I got really close. After much walking back and forth in the water it now seemed to be just on the South shore of the creek. The water was up to my waist as I crossed the creek again and just 4 feet or so up the bank, I hit all zeros! 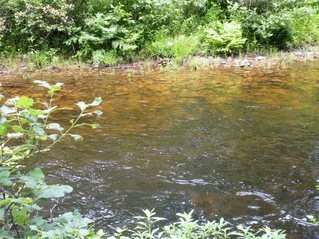 I snapped photos, and because the day had gotten very hot and I was sweating, I took off my shirt and jumped in for a swim in the cool waters of the Black Moshannon. This confluence is in a truly remote and beautiful spot, now out of ear shot of the ATV’s and I-80. I took my time and enjoyed the wilderness waters before heading back to my car.